In December 2018 Propsearch visited Sustainable City and was shown around by the Sales Manager, Stephen Fairhall. Stephen Fairhall, sales & leasing manager at Diamond Developers. Stephen Fairhall: There are 498 villas and 89 apartments here as well as a mixed-use retail plaza area, with a nursery, medical facilities restaurants and shops at street level and the apartments above them. Between two of the buildings we’ve combined two units on each side: one of them will be an artists’ workshop area and the other will be a gallery. So they will have an opportunity to make it and then show/sell it. Propsearch: What about the villas? SF: There's five clusters of a hundred villas. There are ten bigger villas, two signature villas of five beds, and eight garden villas of four beds. The 90 courtyard villas have three and four bedrooms. They are all ‘L’ shaped and there’s five types; Type 1 has a closed courtyard with a community view, Type 2 has an open corner courtyard with a community view, Type 3 has an open corner looking onto a plaza (the central plaza features a childrens playground and the wind tower), Type 4 is facing the green spine area with a closed courtyard, and a Type 5 is facing the green spine with an open courtyard view. The green spine that runs the length of the development. Propsearch: So your type choice will determine the degree of privacy that you want? SF: Yes, exactly, but also the view. Propsearch: Are the villas almost fully occupied? SF: Yes, there’s only about five villas vacant. We’ve been running at about 98% occupancy for the past three months and that looks set to continue for the foreseeable future. Propsearch: What else do you have here? We’ve got an autism centre here already operating, but we’re going to expand it considerably so they can have inpatient residents for three to four month programmes. They’ll have schools and shops, they’ll have facilities like taxi ranks, airport terminals, supermarkets, and the idea is to help them develop their social skills, so they get used to those environments in real life to help them feel more comfortable in regular society. The school here is Fairgreen International, operated by Esol group. We’ve already taken enrolment for about 200 kids and they’re attending a sister school in Al Barari, but starting in January (2019) a section of the school will be open and those kids will be housed here. By next September they’ll have capacity for up to 1,000 kids. And they’ll run a green curriculum as well, so one of the bio-domes will be used by the school and kids will get involved in planting the seeds, watering the plant, harvesting it, taking it to the market, and understanding the full cycle of food and where it comes from, rather than thinking it comes from the fridge. Propsearch: Do you pick your tenants based on their operation type or do they pick you? SF: It’s a bit of both. Hopefully by next year we’ll start rolling out more of a formal application process where we’ll ask questions like “what do they know about environmental or sustainability” or “what have they done in their last house to reduce their DEWA bill.” So we’re looking for people who say “well, I’ve installed ceiling fans to reduce AC” - people who have got some kind of interest, because the city is a working lab, we need our residents to contribute in a positive way so we can maximise the potential of the city. Propsearch: Are there currently any equivalents to this concept in other places? SF: No, not really. There are some things that are somewhat similar: part of the original design came from one of the campuses in UC Davis in California and they’re also one of our research partners in training and development. Propsearch: Did they make use of wind towers? SF: No, that’s the Arabic influence that we’ve brought into it. The wind towers help to cool the courtyard areas. Even that is experimental. You’ll see that we have an evaporative cooling system on top of the tower that is designed to create more cool air that is sucked down and disperses in the plaza around it. Even if it only makes a small difference of a degree or two, it’s one little bit. All the walls are coated with a UV specific paint to try and reflect the heat from the houses that little bit more. Propsearch: I hadn’t noticed that! SF: Exactly, there’s purpose behind it. It’s designed to give a better orientation, reducing heat, without the design getting compromised. If you’re walking from the villa to the car, you’ll find that there’s a great line of shade from these villas coming this way, and if you come home at five or six o’clock, this line of villas is providing you a line of shade that way. So without having to physically cover all of the walkways, there’s quite a lot of shade provided by the buildings. Stephen then took us on a ride around the city. Propsearch: Looking at the rooftops, these look like solar panels which double up as sun shades? All villas come with solar panels on the rooftops. SF: Yes, exactly. We’ve tried to make a lot more use of vertical living. Most developers will ignore the rooftop but it’s a perfectly usable space if you get it right, so on our rooftops we’ve got water, we’ve got drainage, we’ve got electricity and we’ve got lights. We’ve got that natural shade cover and the solar. The idea of solar panels on rooftops never used to exist in UAE. We worked closely with DEWA to establish the framework for this. And now other developers can get fast approval because the model is already set. What we do, is reverse metering. So when the sun’s up it’s generating electricity. If you’re using it, fine, you’re using it first before you use anything from DEWA, but if you’re not at home and nothing’s on, anything you generate goes to DEWA. They run an equal tariff system, which means that if you send them 400kw for the month, your first 400kw of the bill is free. What we’re seeing is that people make huge savings on DEWA bills between 50% and 60%. Only about 20% of that is coming from the solar. The other 40% is coming from the design of the house, the extra thick insulation, the specially made windows use slightly thicker glass with slightly more space between the panes, which gives a higher thermal and acoustic insulation. Last year Dubai announced their Dubai green building standards. One of the standards that they outline is that they want communities or developers to get down to buildings not requiring more than 160kw per meter per year. 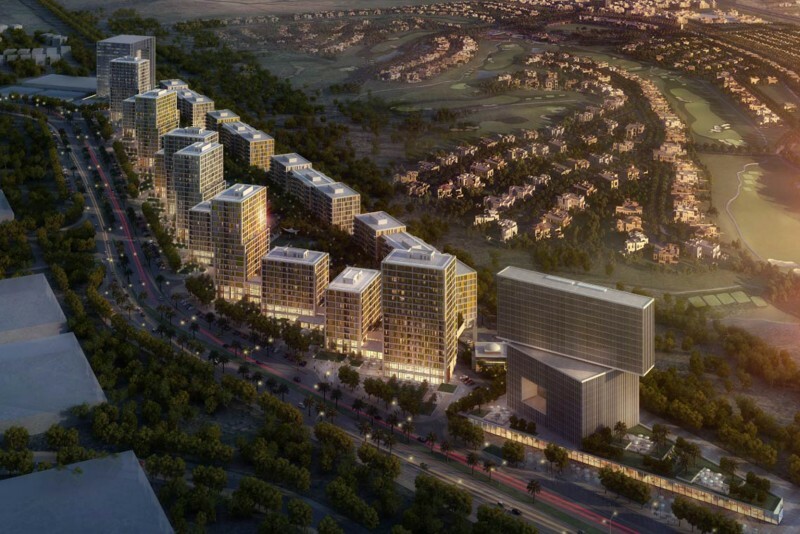 Sustainable City is averaging 97kw per square meter per year - which to most developers is jaw dropping. They just don’t understand how we can do it. Propsearch: What about car parking? SF: The ninety Courtyard Villas all park outside. Only the Garden and Signature Villas have access to this small road with their own direct parking. So the Courtyard Villas all have two allocated parking spots, and it is done in such a way that the villas furthest from the car park have the closest parking space. Propsearch: So everyone has as equal as possible walking distance to the car? SF: As equal as possible, and the furthest distance shouldn’t be more than 75 metres. It’s not a huge distance, and again, with the shade it’s not such a big walk. When people are carrying car seats or shopping we have an app where you can request the concierge to come and pick you up from your house and take you to the car. We also have buggies that residents can drive around themselves; we have shuttle buses that run around the community; we have RTA elective driverless buses that go around the city as well, although that’s still at a trial phase. Propsearch: Do the residents just leave the buggy outside their house once they’re done? Residents have access to electric buggies to travel around the development. SF: Just leave it there, yes. Security and concierge have an algorithm on their computers that says, for example, ‘too many buggies in cluster four’, and they can go and redistribute then. So inside the set of ninety villas there are no gas powered vehicles, only buggies, bikes and the autonomous bus. What that creates is a very safe, quiet and fume-free area. It’s a very safe and friendly place. Propsearch: Do you know how many families have kids here? SF: Almost all of them, well above ninety percent; it’s a very family orientated place. Propsearch: What facilities do you have for kids? SF: Every cluster has its own kids play area, so there’s five of those in total. We also have numerous outside exercise points around the community. We have our own indoor gymnasium with an outdoor 25-metre lap pool, and then a family resort style pool. We separated these purposely to allow kids to make plenty of noise in one place as well as providing a quiet place for adults. Adults only lap pool and gym. Internally there’s a soft running track and a blue trail cycling or jogging track. We have our own equestrian centre and there’s an equestrian trail that runs around the outside of the running track. Running, cycling and horse riding track. One of the things we’ve done is planted more than 10,000 plants in Sustainable City and on the external barrier of the community we’ve got three layers of trees, all very well established now, to reduce the dust and the noise coming from neighbouring communities. The gym wasn’t actually in the masterplan but we built it based on feedback from residents. Some of the equipment in the gym is hooked up to the grid so as people are running or cycling it’s actually putting electricity back into the city. Propsearch: There’s a lot of greenery here. SF: You see a lot of vegetation here due to these Arabic style sluices. A regular stream will pass and then the water will come down through these concrete viaducts and water the plants. The fish and turtles in the lakes and all these reeds are purposefully chosen to help maintain the chemical balance in the water. We have several different types of date palms all around and we’ve produced a harvest this year of over 50,000 kilos of dates. Shipping container where strawberries are grown. This shipping container here is Agricool, a French company that are growing strawberries in there hydroponically. No dirt, no pesticides, nothing like that. It uses about one cubic metre of water per month and it produces around 4,000 kilos of strawberries a year. What we harvest at the moment we’re giving away to residents, but it will be commercial grade soon. Propsearch: Could residents eventually have their own grow containers? SF: Not yet, but we do have allotment style gardens here and people can rent a small space for about 150 dirhams for the season. We have residents here growing tomatoes, corn, sweet potatoes - all sorts of different things. We provide the water to their patch, they just have to fertilize it and grow whatever they want in it. Residents can collect freshly grown herbs for free. As part of the working farm of the city we have eleven bio-domes where we grow more than 30 different varieties of herbs and fruit bearing plants, so chillies, basil, mint, sage, that sort of stuff. We’re only producing around 300,000 pots a year but we have the capacity, once we get more distributors, for about a million pots a year. We’re experimenting here with mango, papaya, watermelon, Indian almonds and pomegranates. There’s a whole load of fruit bearing plants around the community, not all fully harvested or commercial, but we’re trying different things to see what works well. We’ve got our own bee farm and people can buy their own hive and become the owner of the honey in it. And it has sensors so you can monitor how many bees are in or out, how much honey is being produced as it weighs it on a scale. Then we deliver the honey three times per year. SF: Black water is sinks and toilets; grey water is hand basins, showers, washing machines, etcetera. So the grey water we treat and fill that stream and also irrigate the communal green space, the fields. Now that the municipality have their treatment facilities up-and-running we’re actually putting everything into one pipe. We send it all to them, they treat it all and we buy it back, which is more efficient than when we did it on site. We have all these recycling bins, you’ll see as you go around. All of our trash goes to a company called Tadweer, and whether people separate it or not we pay them to break it down further. They tell us that 83% of our waste doesn’t go to landfill, so only 17% is regular trash which needs to be land filled. Having the city full helps us as we can generate much more real data. For example, it’s much easier to measure the water consumption. Propsearch: So the school is nearing completion? SF: Yes, part of it will be done in January. The kids we see here are doing experiments on solar - putting containers with cheese in and they come back and see how much the cheese has melted - to understand how much heat it generates. In this dome here we use a combination of hydroponics and aquaponics. Propsearch: Whats the difference between hydroponics and aquaponics? SF: Basically we have a massive big fish tank, and we feed the fish, and then we use the water from the fish tank, and the nutrients in it to feed the plants. [Instead of conventional air conditioning we have] these evaporative cooling systems like we have on the wind towers as well. So, water will pump up to them and it just drips down and acts like an air conditioning system - and then with these vents and fans you can regulate the temperature in the dome depending on what you’re growing. One or two degrees difference can be the difference between growing mint or basil. Propsearch: What’s special inside the villas? SF: All of the appliances in the villas are included - they’re all green-star energy efficient. The gas is central, there’s no bottle gas. We even have waste disposal systems built in under the sink. For laundry, we provide the washer/dryer machine and we provide the recycling bins. Living room inside the show villa. The houses are networked to Du and Etisalat, not one or the other, so you can choose. We have a maintenance system where a tenant doesn’t have to pay for any parts costing less than 50 dirhams so, for example, if a light bulb was to blow our maintenance team will come and replace for free. On the roof all of our solar hot water equipment is off to one side so you have a large open terrace. You’ll notice every single room has its own AC control unit, whereas most villas elsewhere typically have one unit for two or even three rooms. That means they require massive compressors that usually need to be on all the time and draw a massive current, whereas the system we have has multiple smaller compressors all lined up together, each of which can power down when not in use. Propsearch: Are you looking to take this concept to other places? SF: We’re already talking quite actively with developers in South America, Europe, Asia, Australia, Africa – you know, we’re discussing quite realistic projects. Propsearch: Thanks for showing me around! SF: No problem! Well you need a good hour to fully see and understand it all.